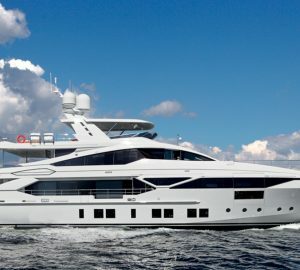 Built by the leading Italian manufacturer Benetti, superyacht CHEERS 46 (Veloce 140') is a superb 42-metre vessel, launched in 2014. 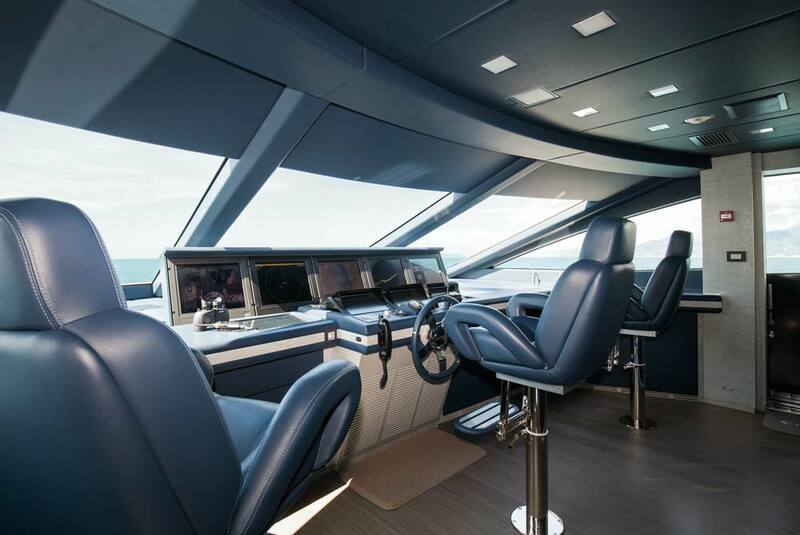 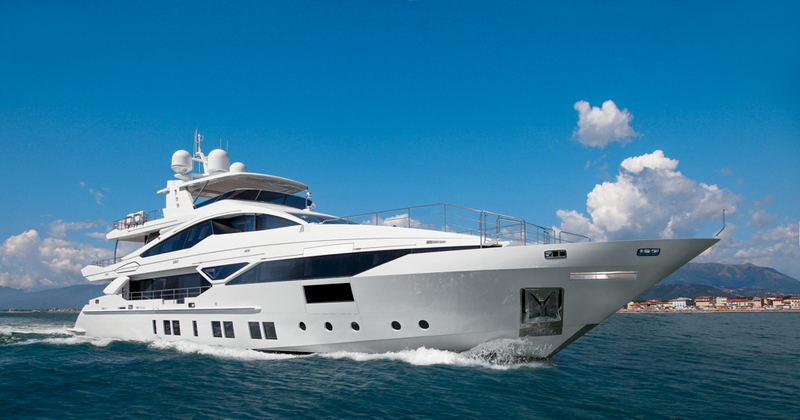 F-140 motor yacht CHEERS 46 belongs to the Fast Displacement line of composite yachts. 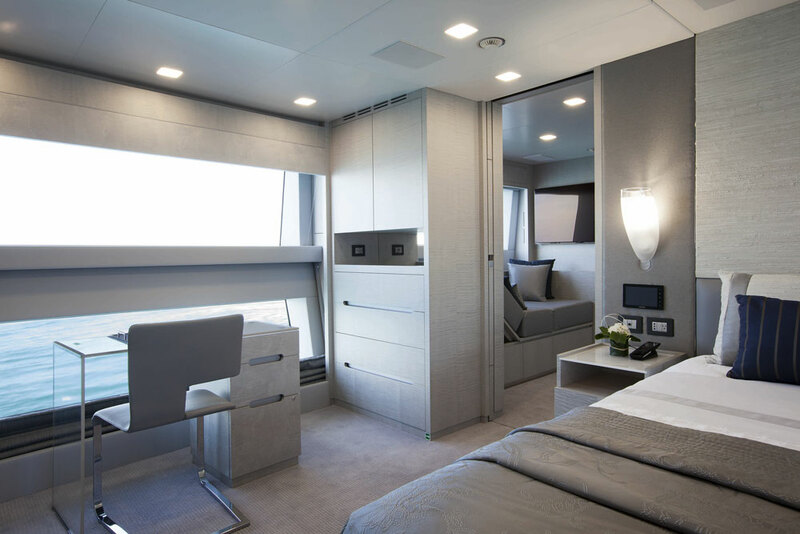 Her lovely interiors have been created by the acclaimed British studio, Redman Whiteley Dixon, with exterior design by Stefano Righini. 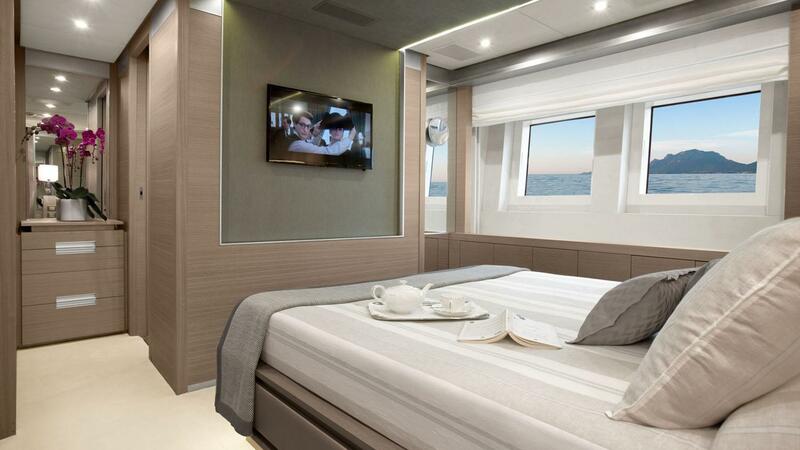 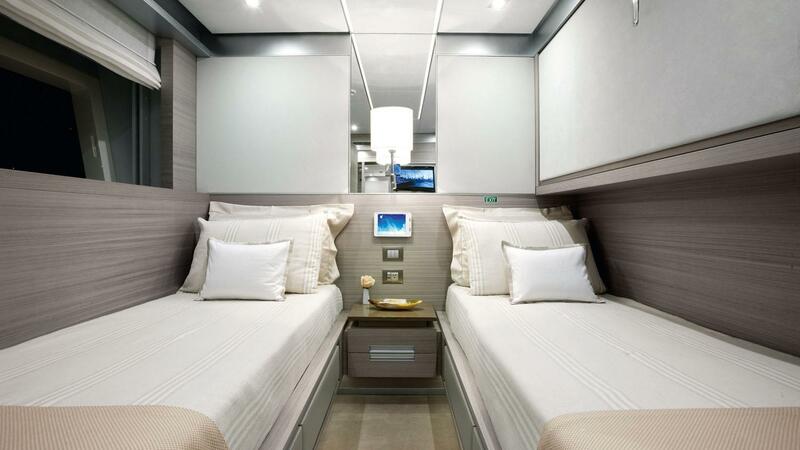 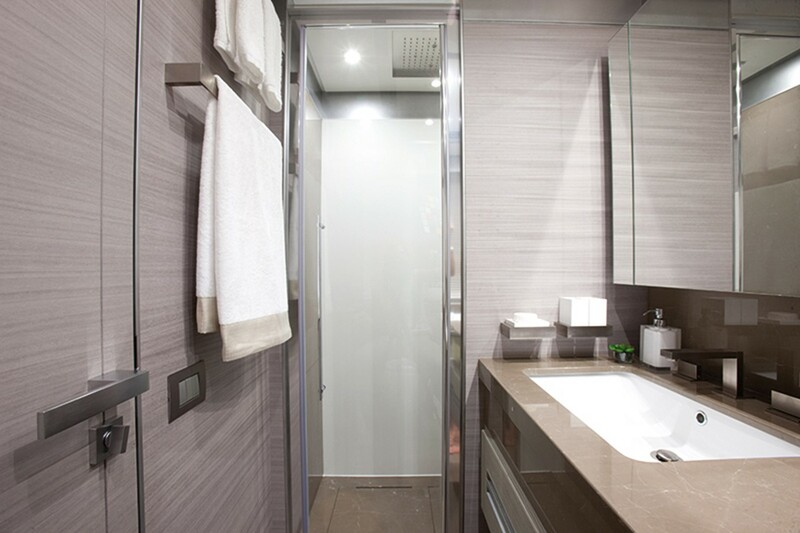 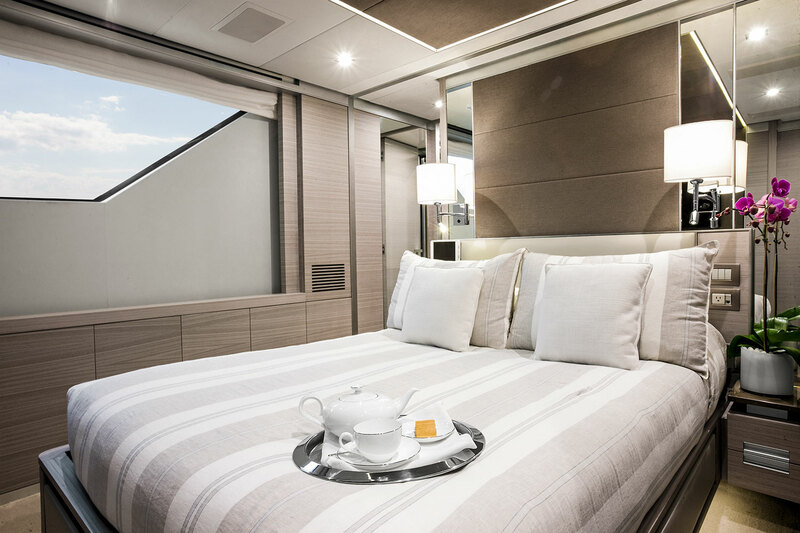 Accommodation onboard is offered in 5 cabins for a total of 12 guests. 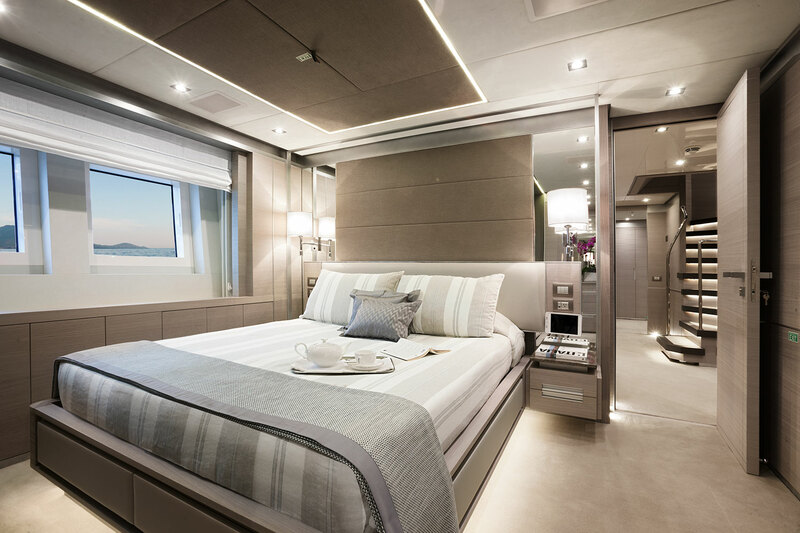 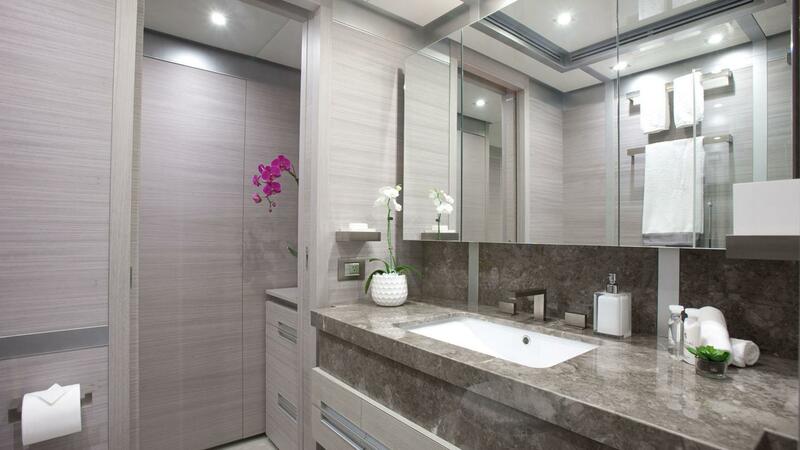 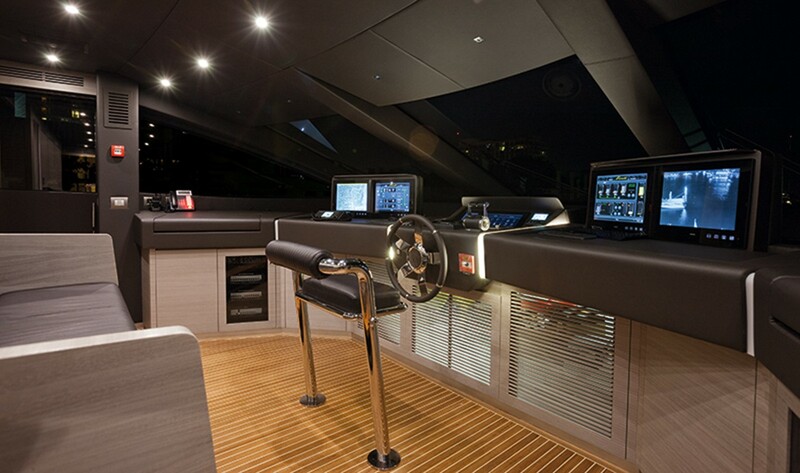 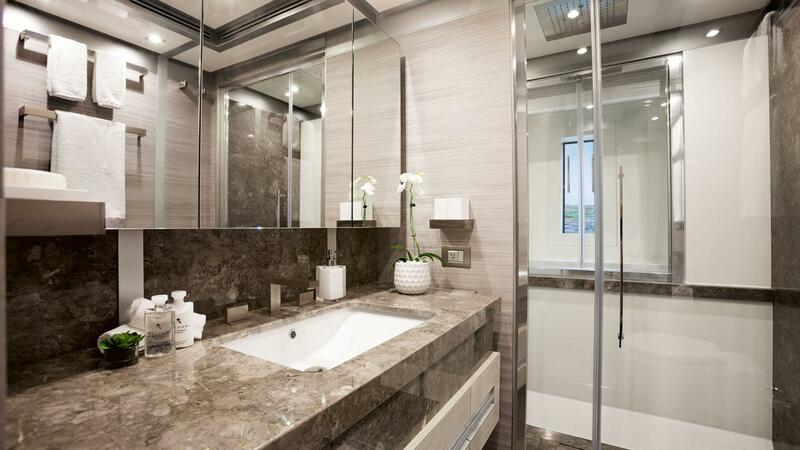 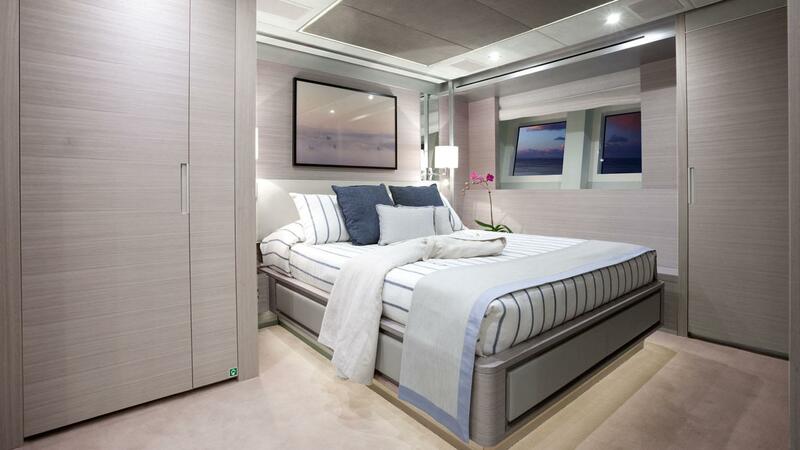 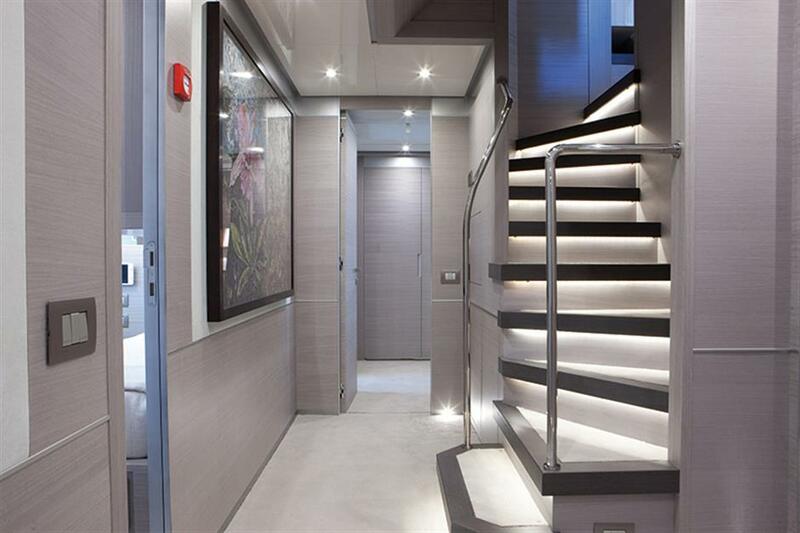 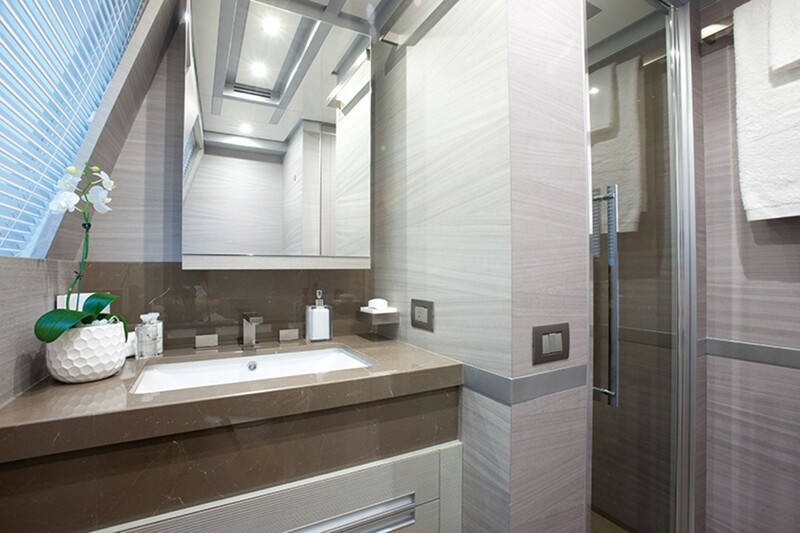 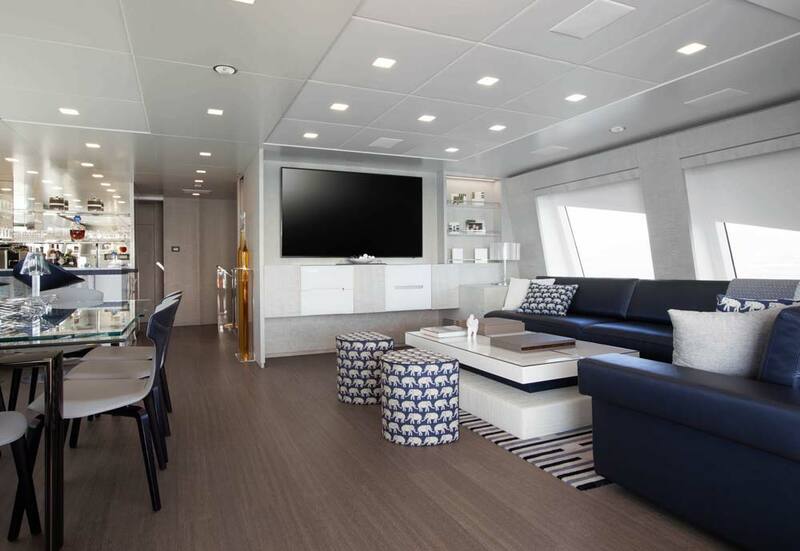 Luxury interior of CHEERS 46 boasts some beautiful elements with Kato wood, as well as African and Tabu woods. 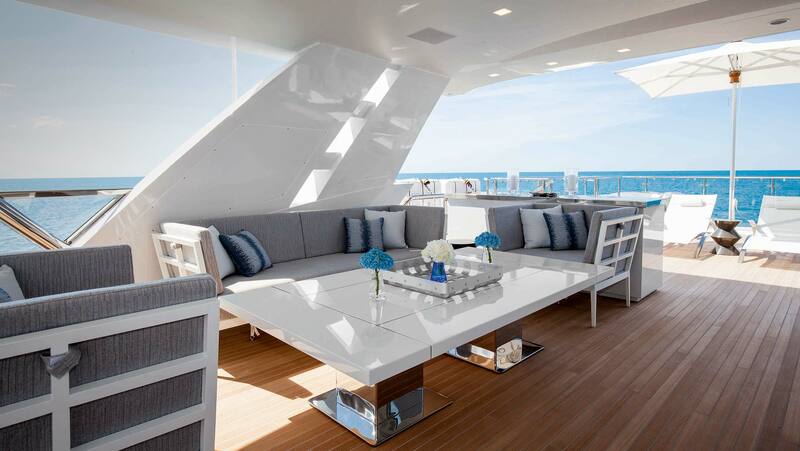 The atmosphere is welcoming, with bright daylight and soft tones furniture. 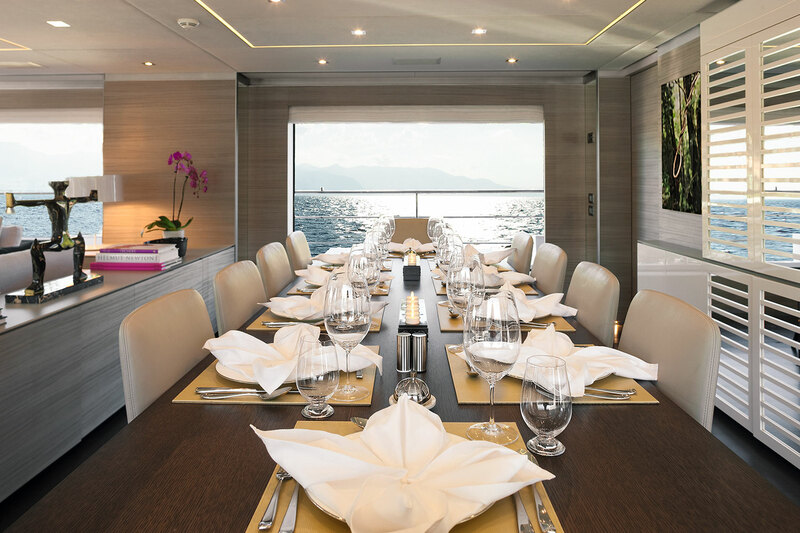 The formal dining area is located aft from the foyer and seats 12 guests - ideal for special occasions. 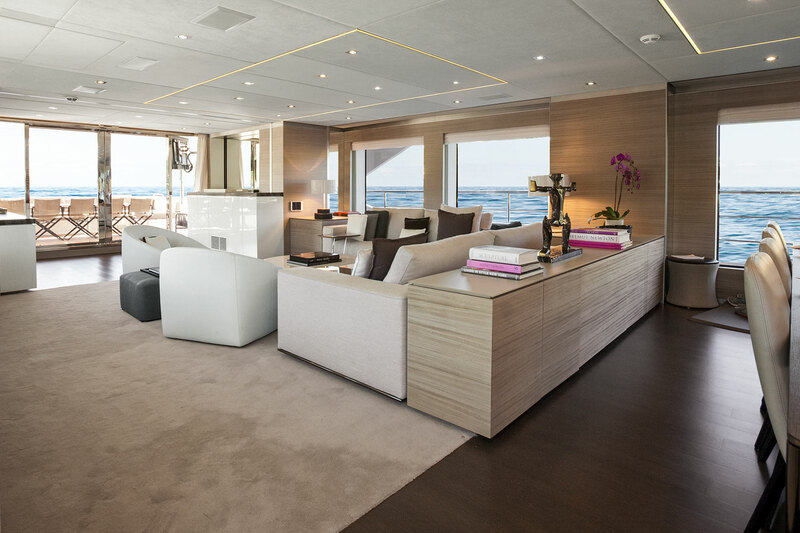 The main salon is a perfect place for relaxation and unwinding with a cup of coffee or cocktails. 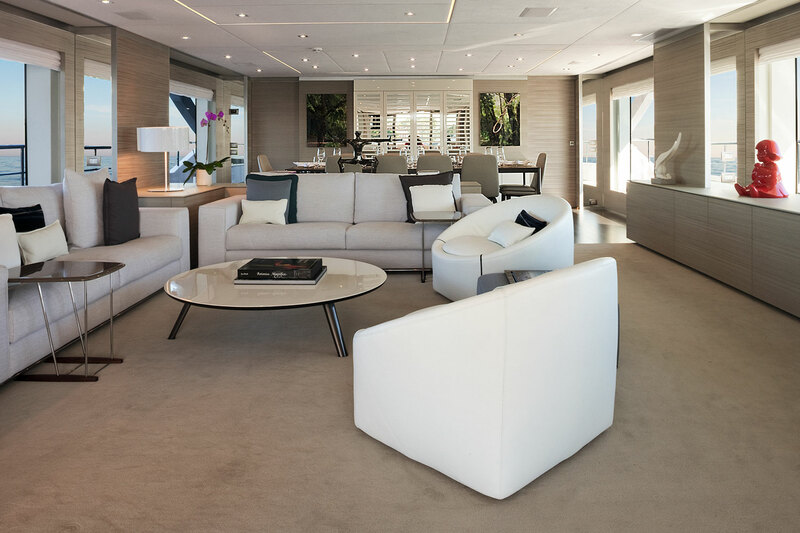 There the guests will find an L-shaped settee with luxurious chairs and a coffee table. 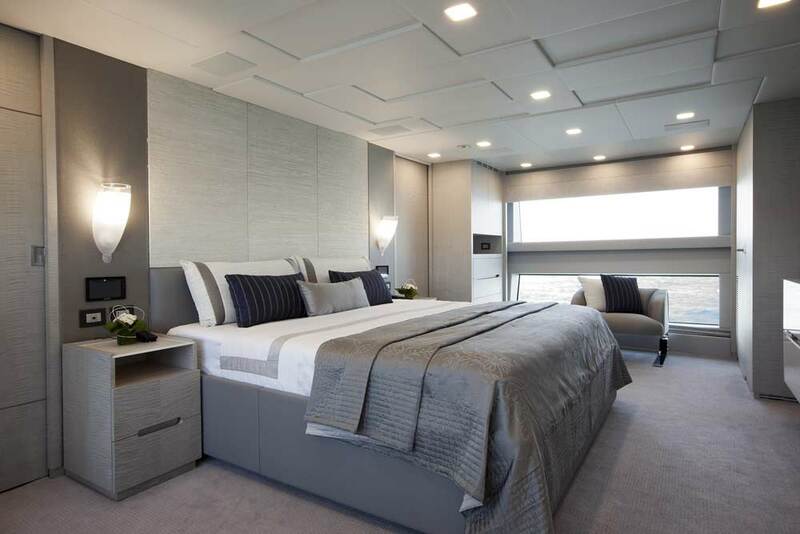 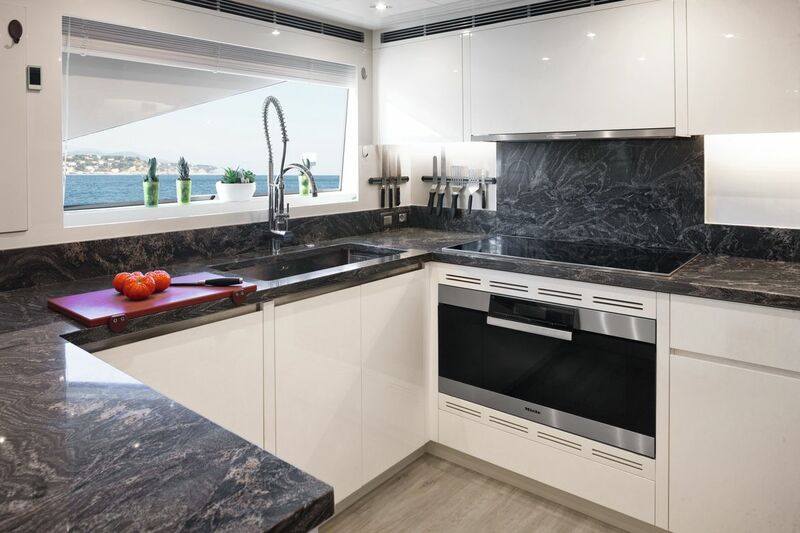 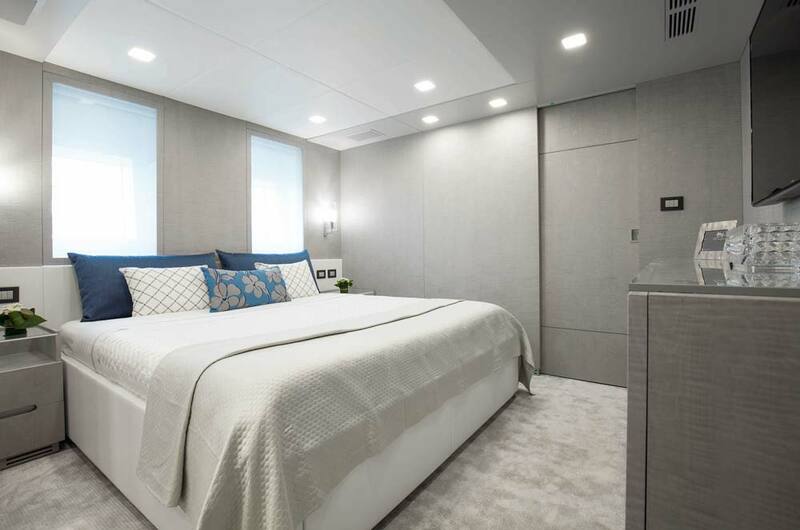 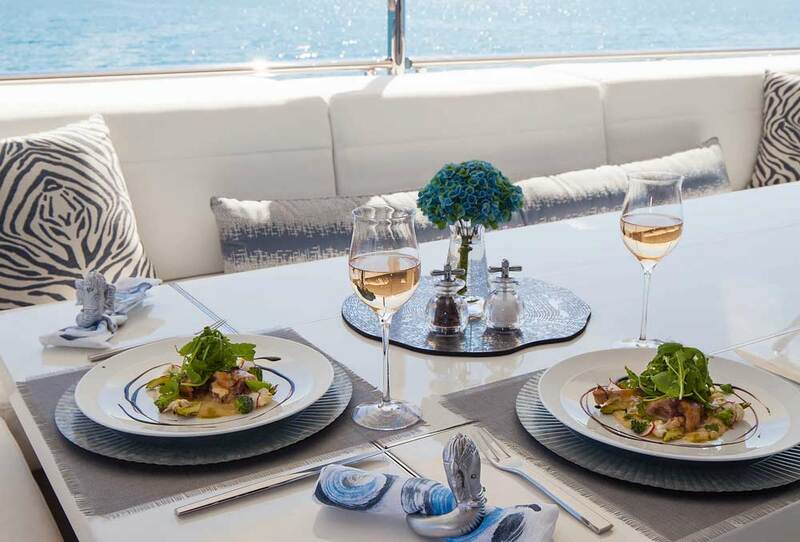 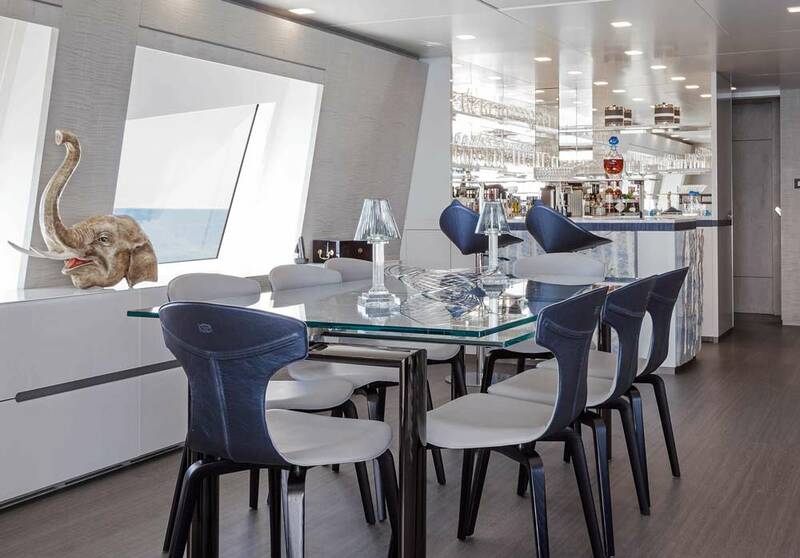 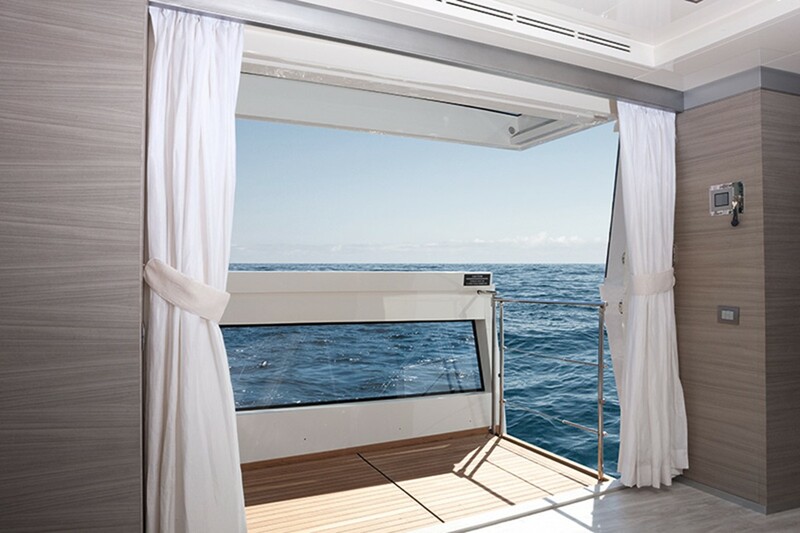 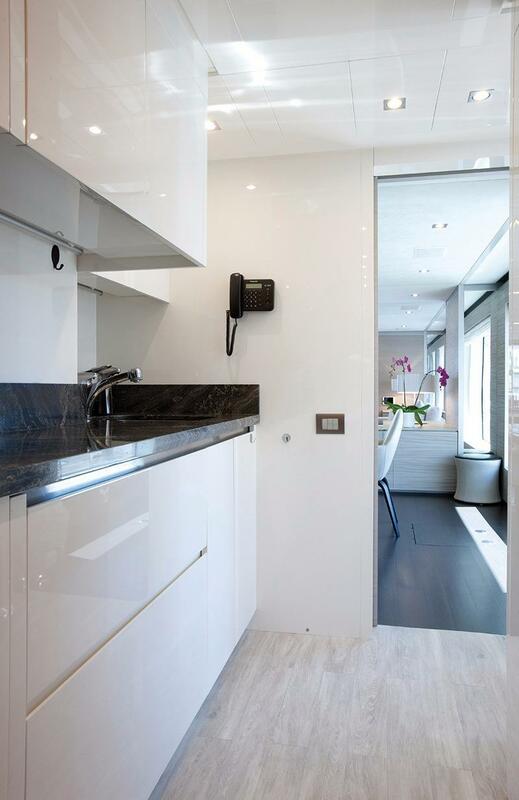 Large windows in the galley, located forward to port, allow plenty of natural light, while state-of-the-art appliances and facilities are there for the highest standard of exceptional cuisine preparation and service. 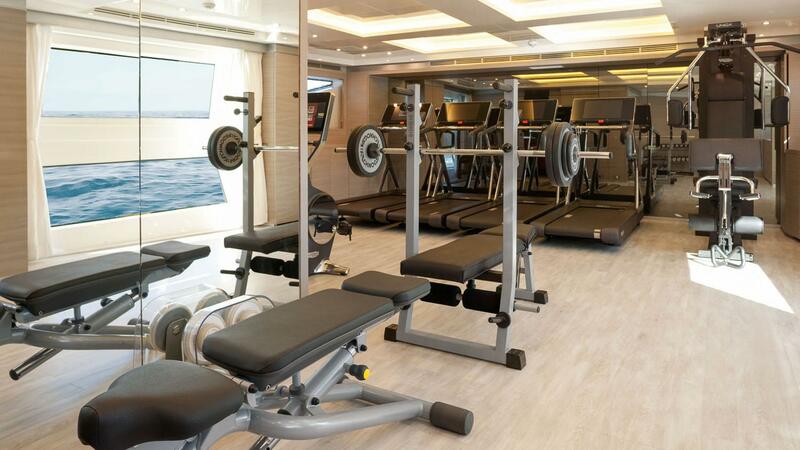 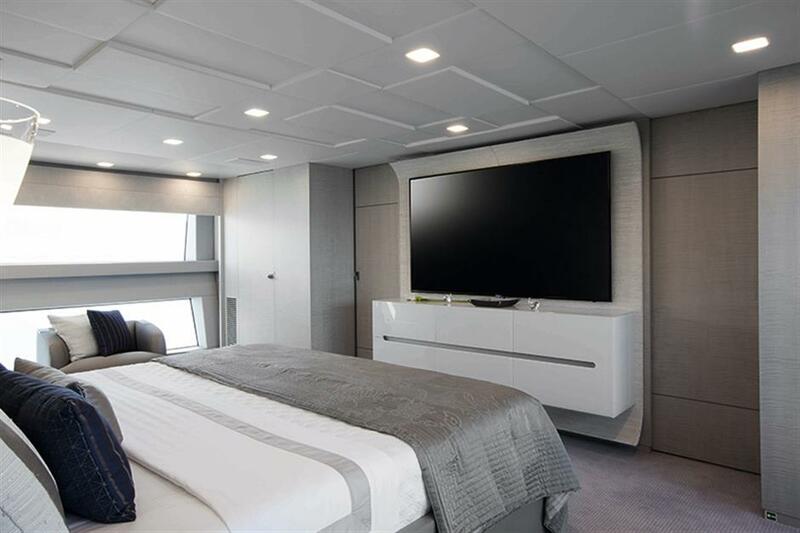 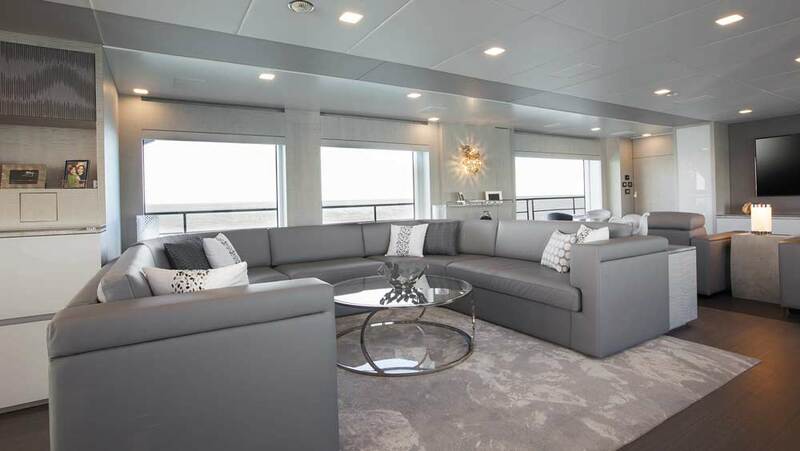 Forward on the main deck is the large gymnasium with a TV and air-conditioning and terrace. 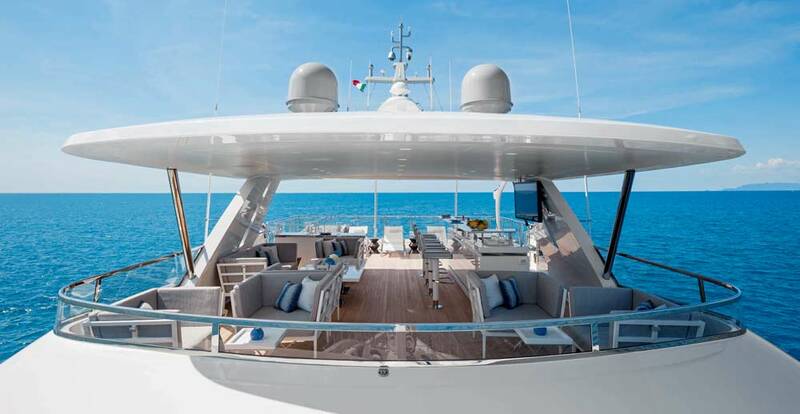 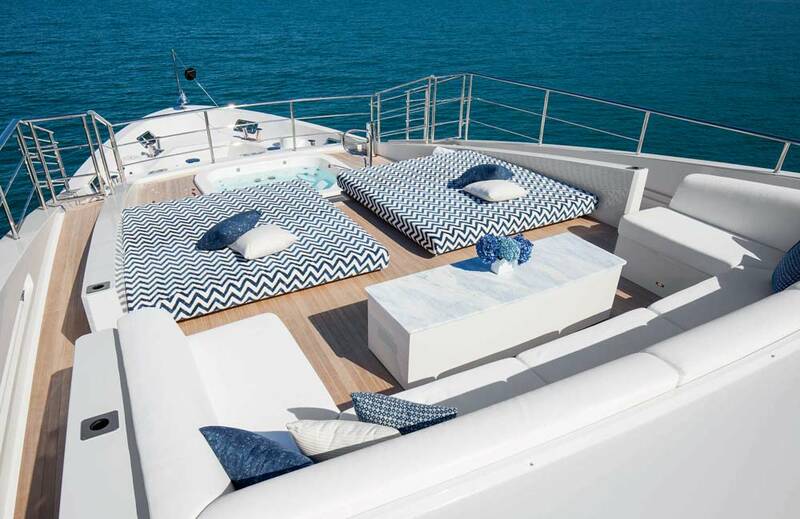 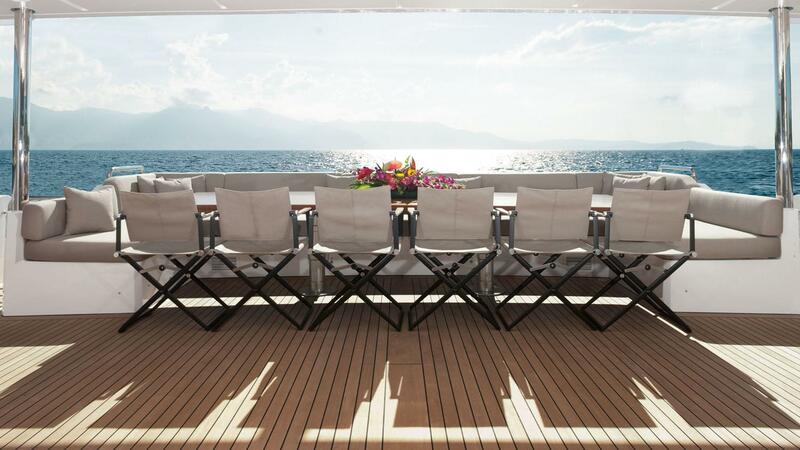 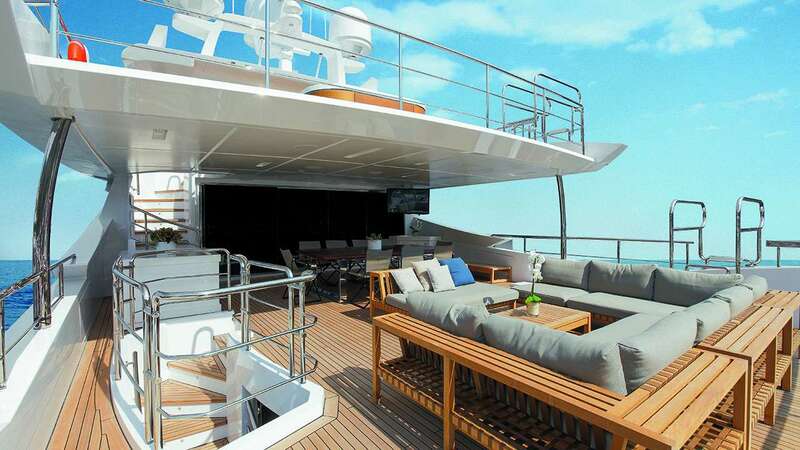 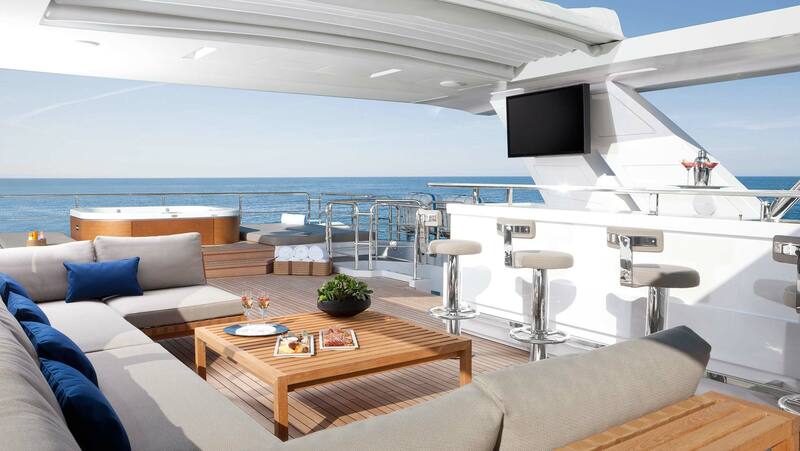 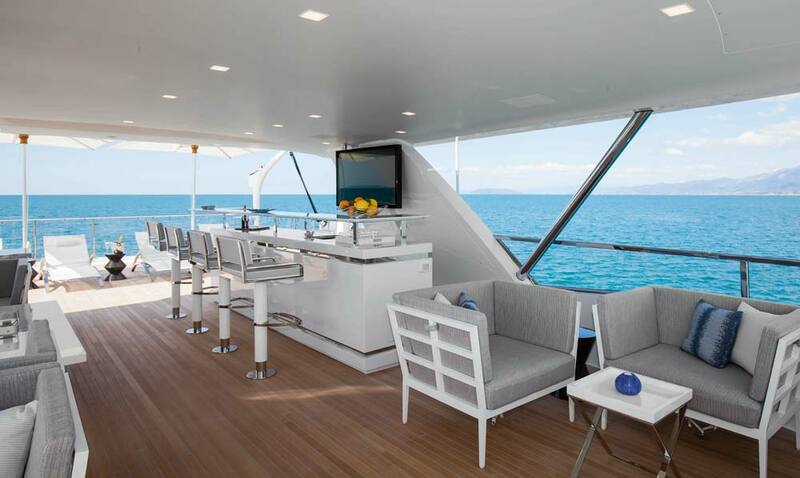 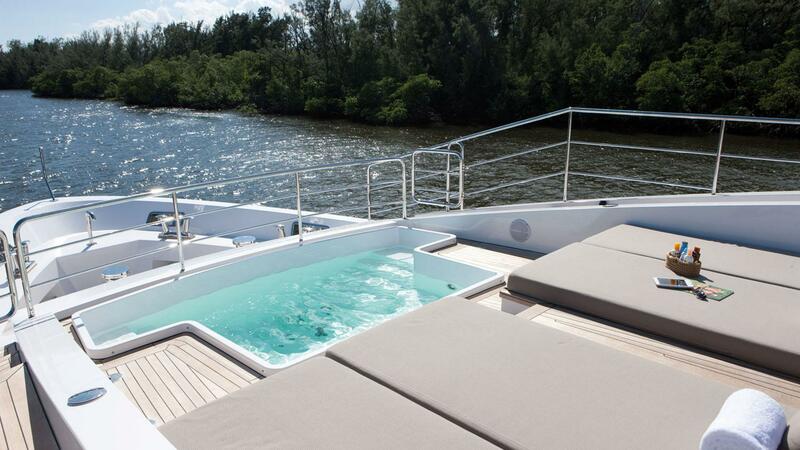 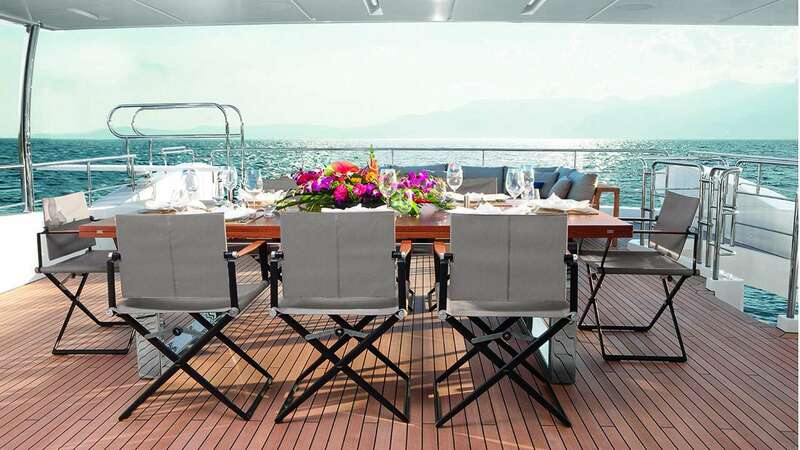 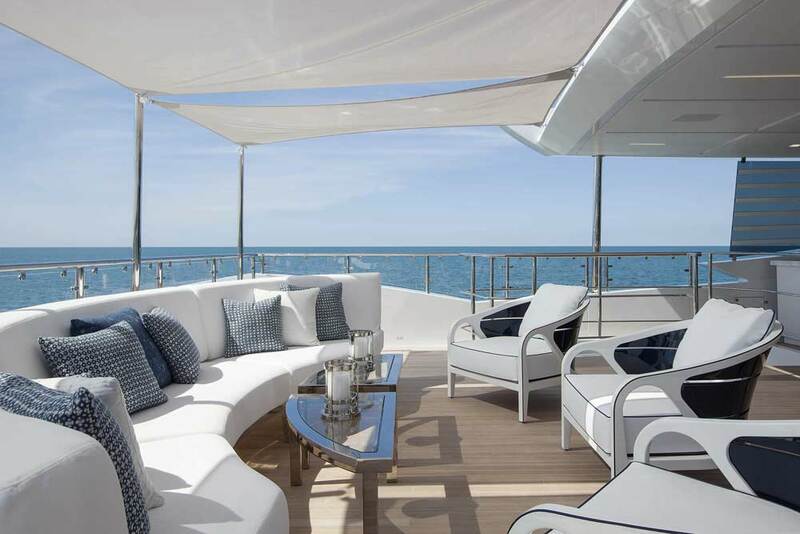 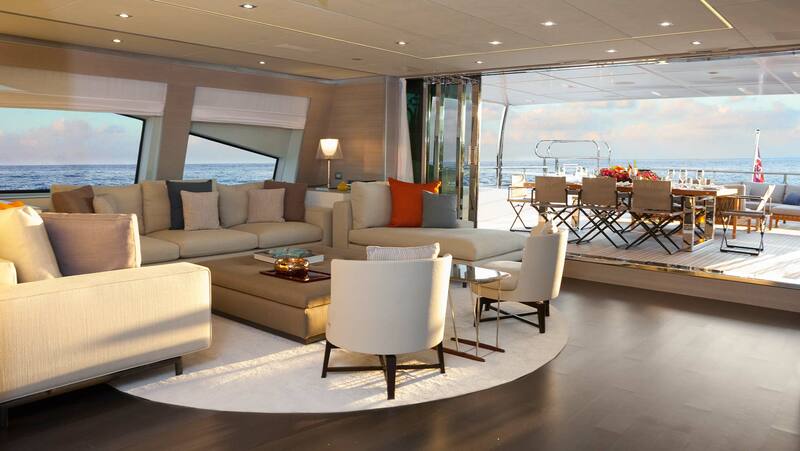 Aft of the main deck is of a generous size, featuring a seating area with chairs and tables. 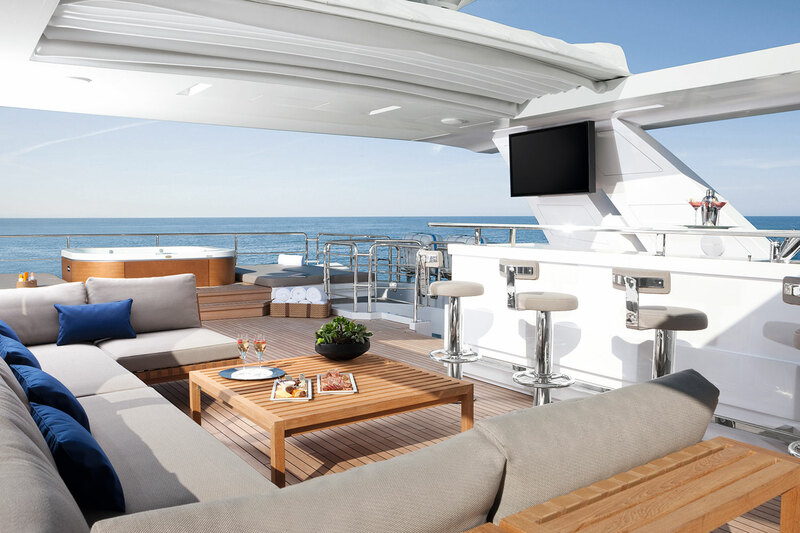 The upper deck hosts an ample sky lounge and pilothouse. 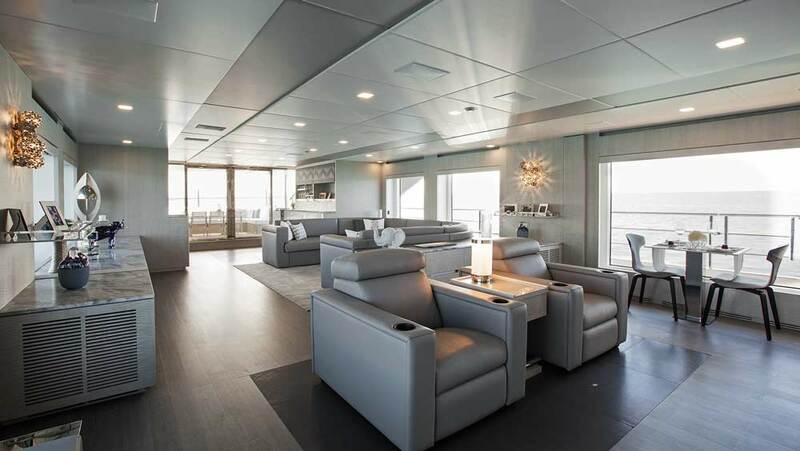 Th sky lounge features a formal dining area for 16 guests, lounge, and a service area. 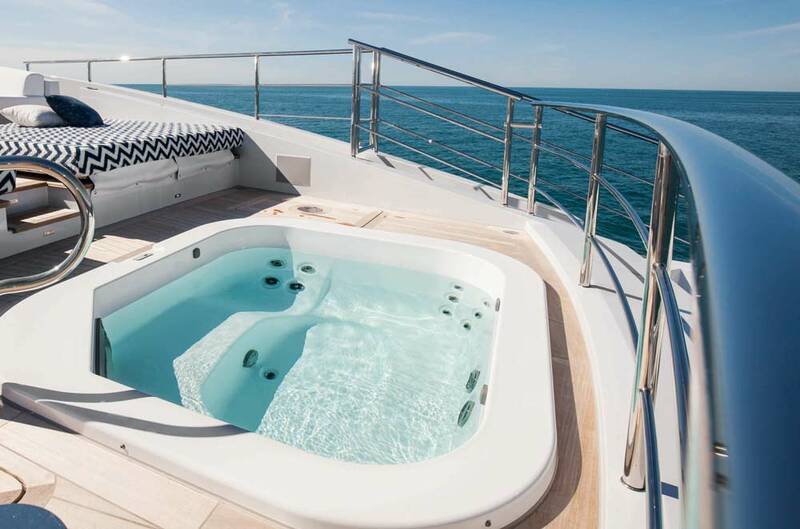 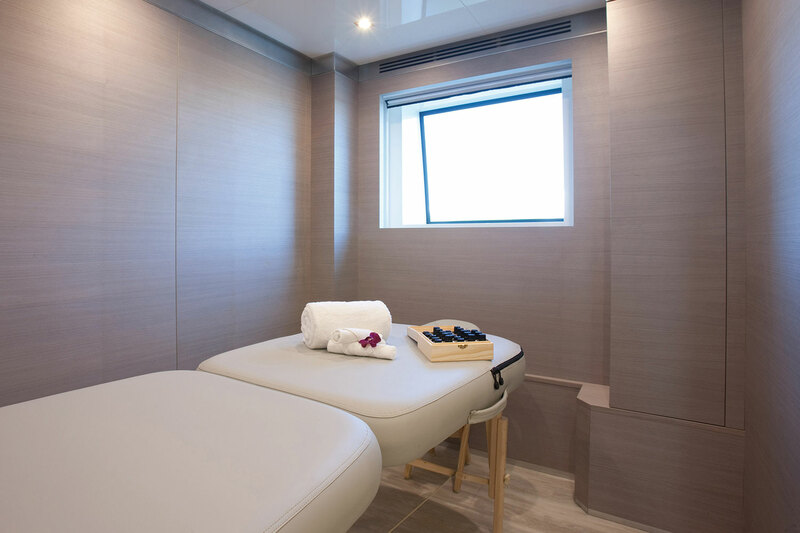 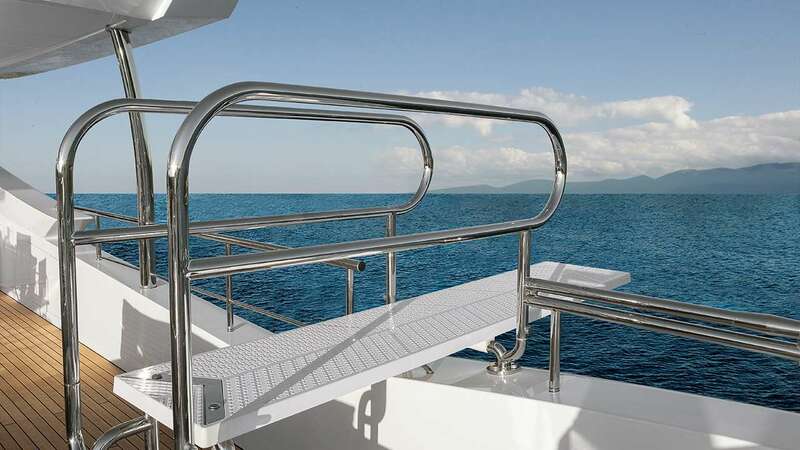 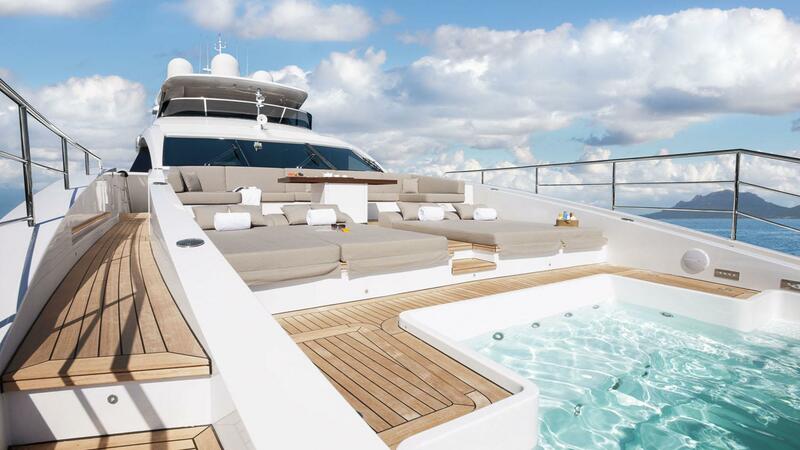 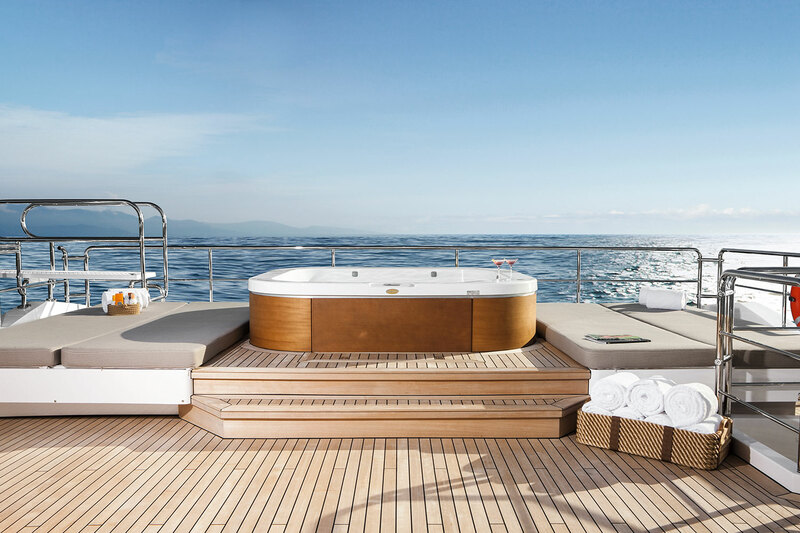 There is also a Spa pool and sunbathing area forward of the upper deck, which provides a fantastic opportunity for soaking up the sun and magnificent views. 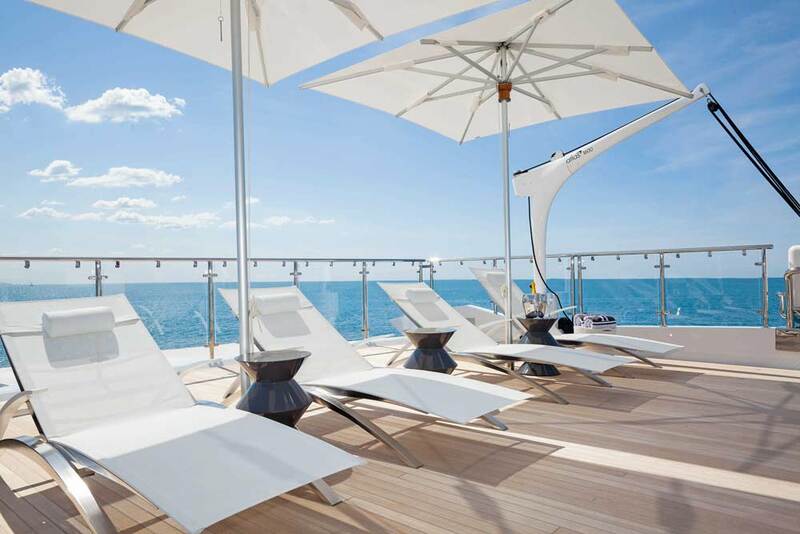 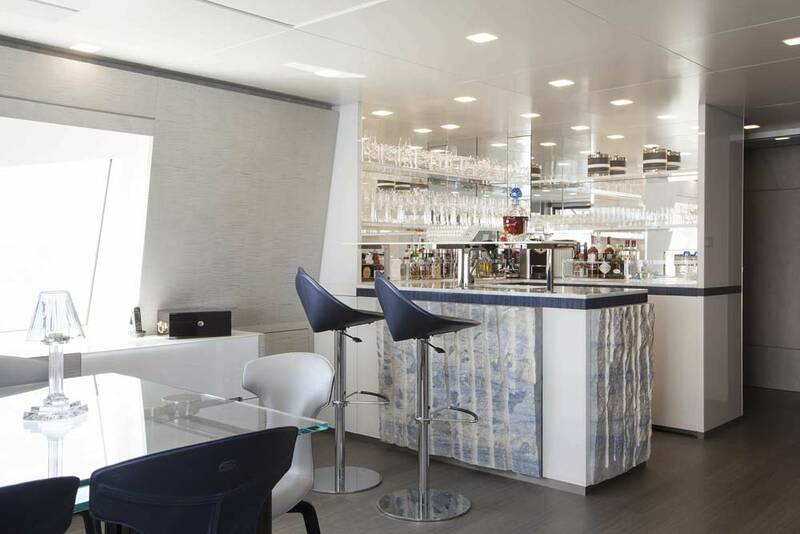 The sundeck is the entertainment hub onboard: there are Jacuzzi, sun pads, and a bar. 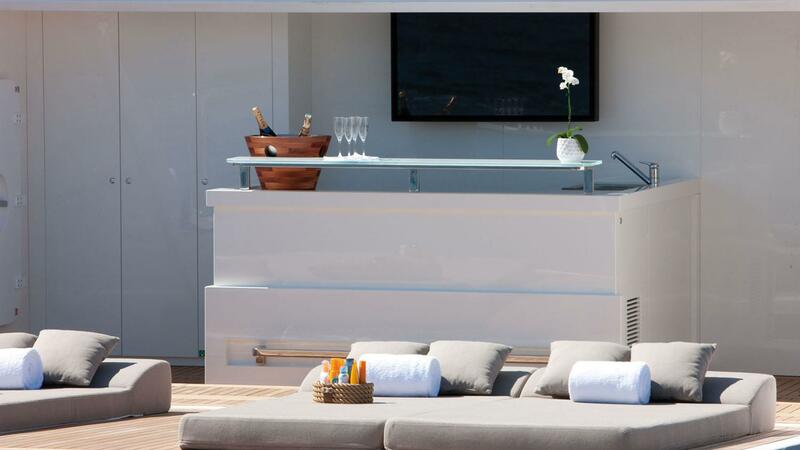 For easy access to the water, there is a swim platform, which hosts a Beach Club with an umbrella. 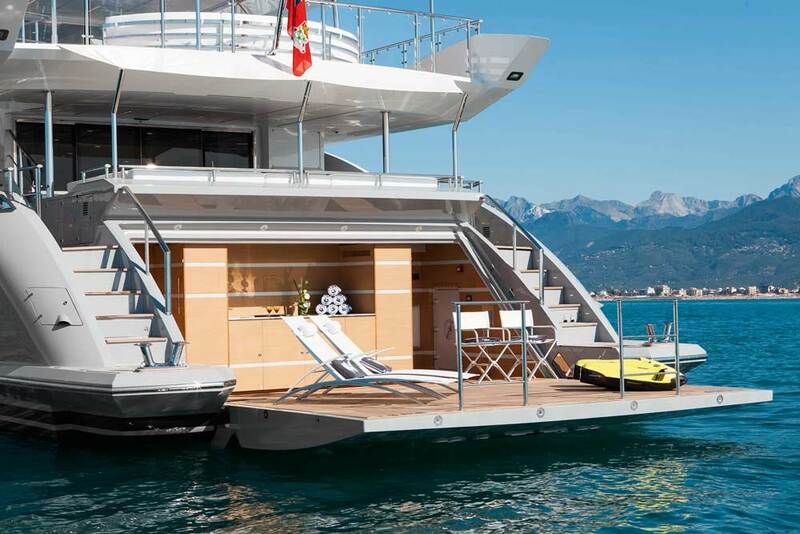 An array of water toys will impress the guests with various choices of water sports activities. 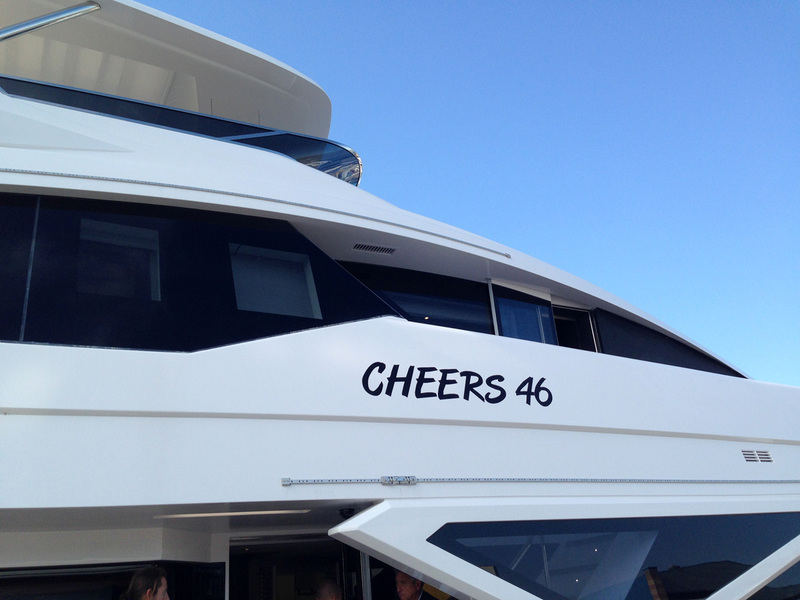 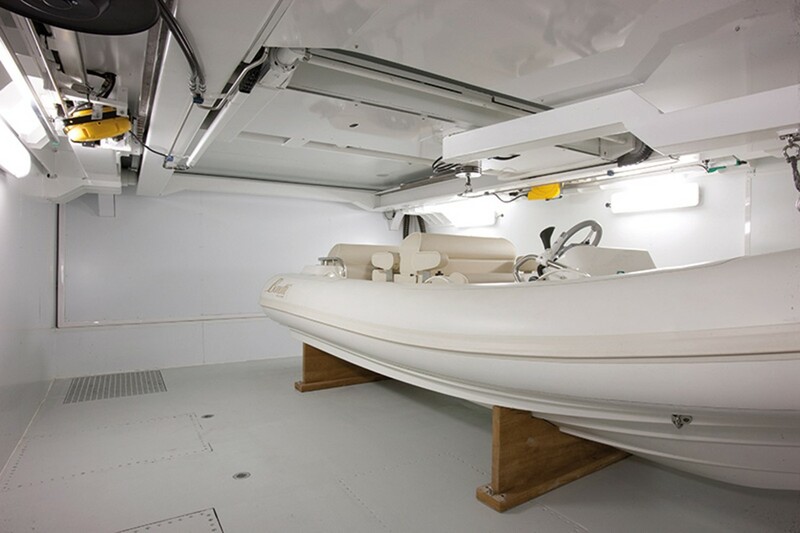 CHEERS 46 also has a garage with a Williams 445 Dieseljet tender, jet skis and other water toys. 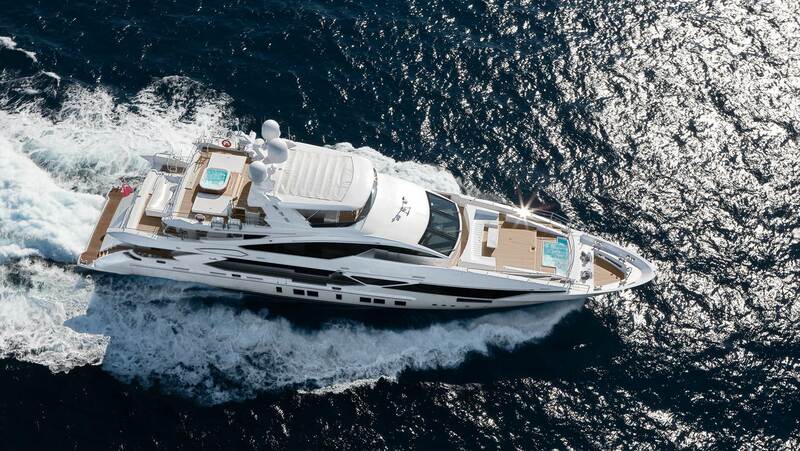 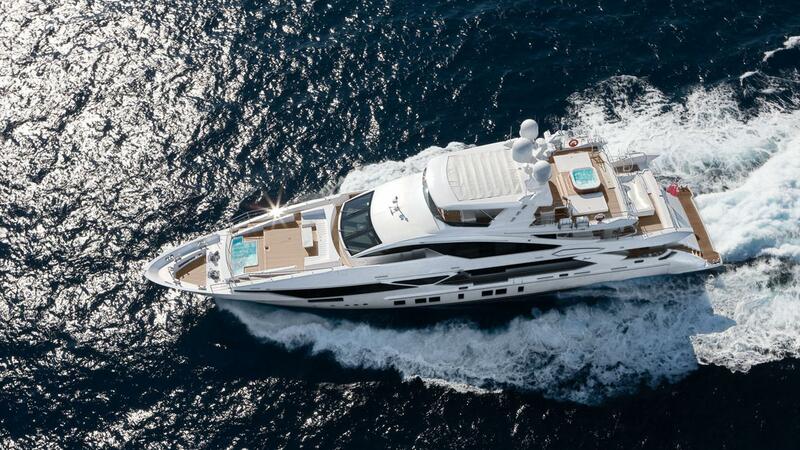 Benetti luxury yacht CHEERS 46 (Veloce 140') can reach a maximum speed of 21 knots and a cruising speed of 16,5 knots. 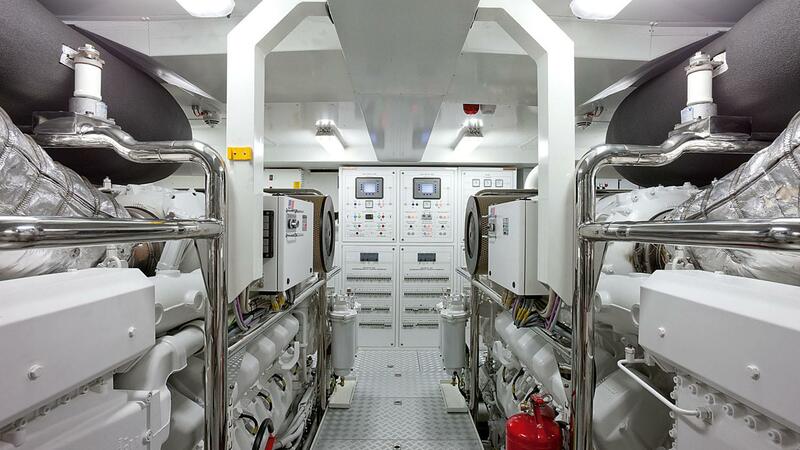 She is powered by twin MTU 12V 4000M93L 3.508 hp @ 2.100 rpm diesel engines. 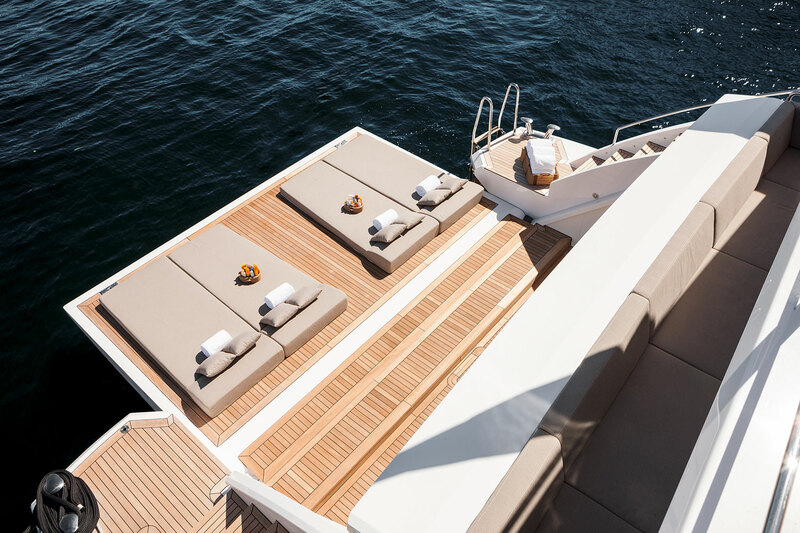 The Fast Displacement yacht Veloce 140 is equipped with a revolutionary D2P_Displacement to Planing® hull, which unites sportiness and the performance of a planing hull with the comfort and quiet of a displacement hull. 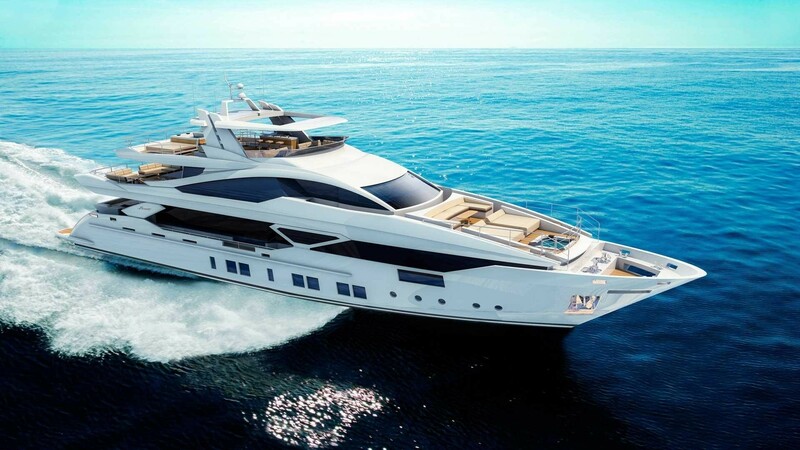 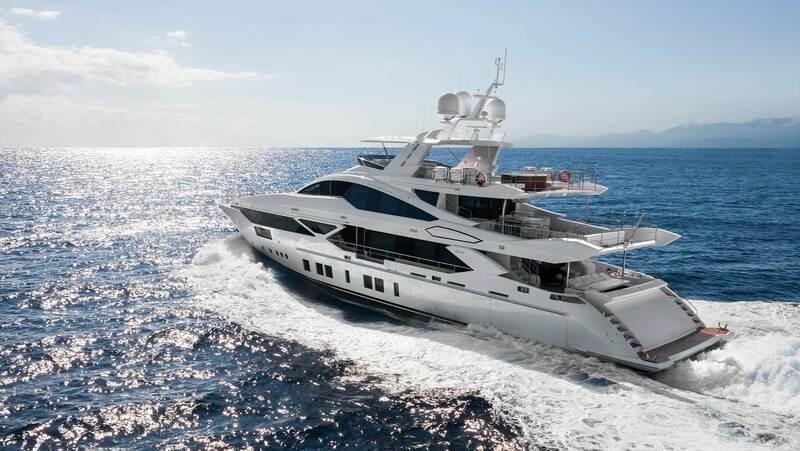 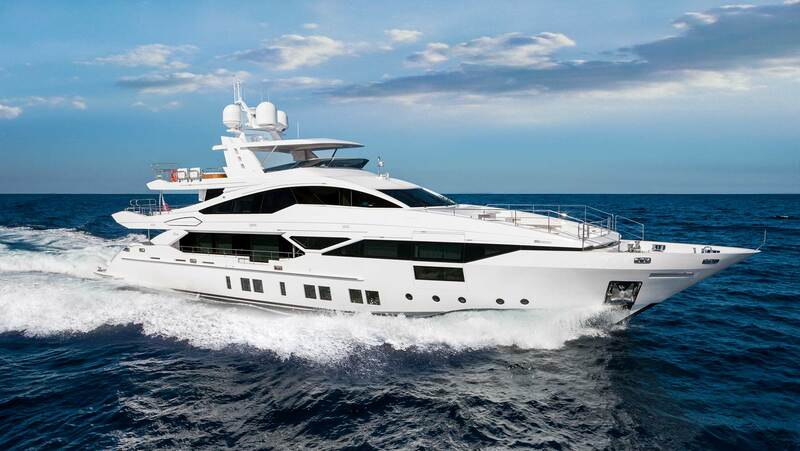 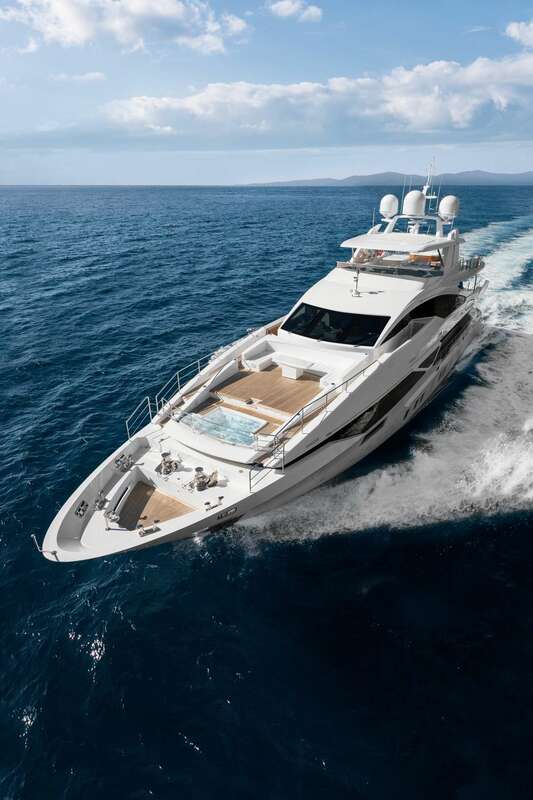 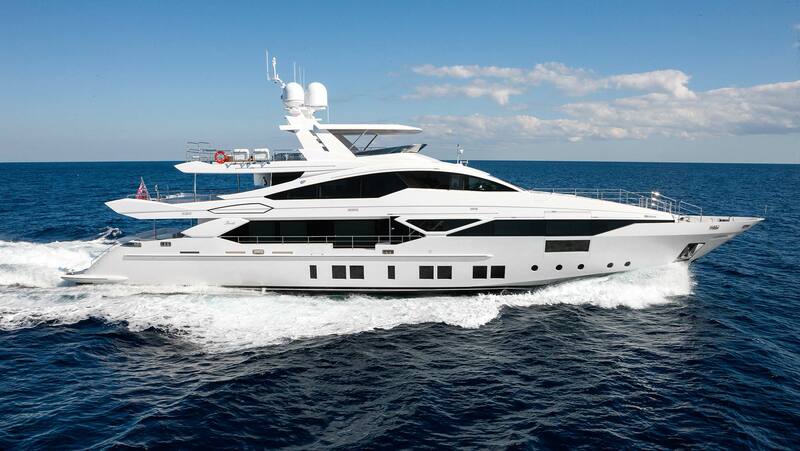 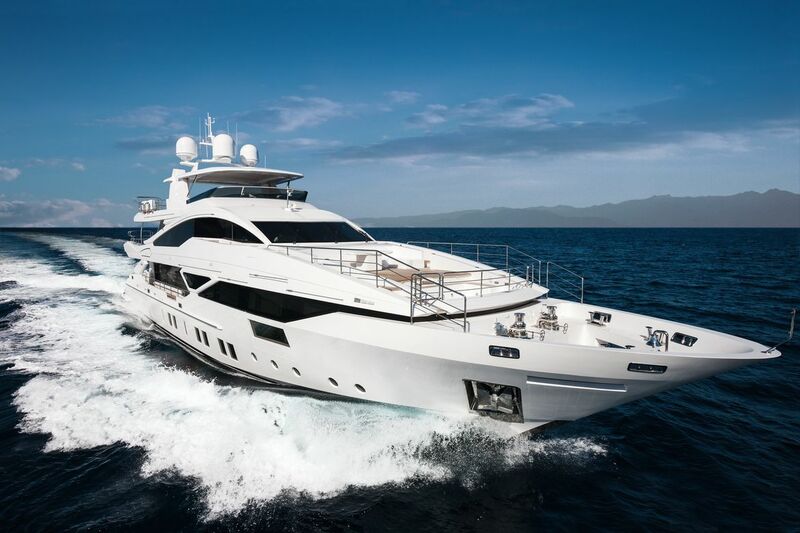 Veloce 140' yacht CHEERS 46 can comfortably accommodate 12 guests in total in 6 well-appointed cabins. 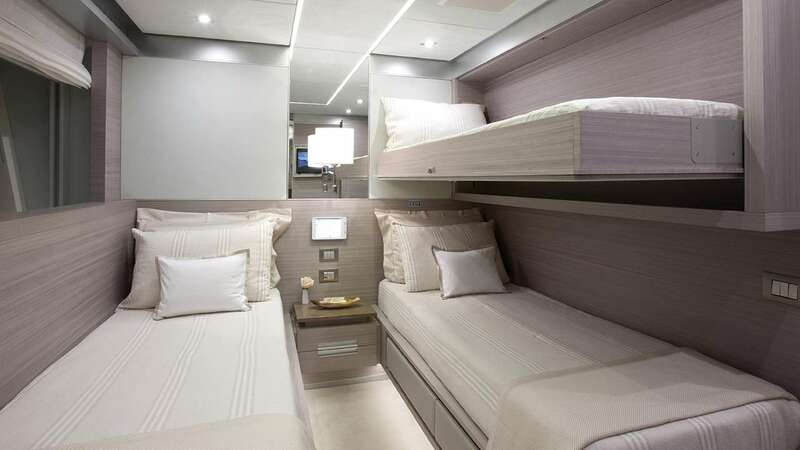 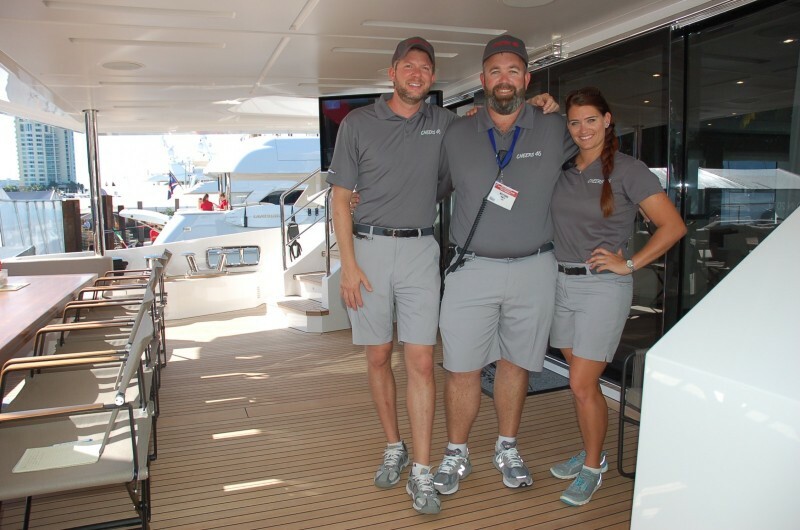 They are looked after by a professional crew of 8 members, sleeping in 4 crew cabins. 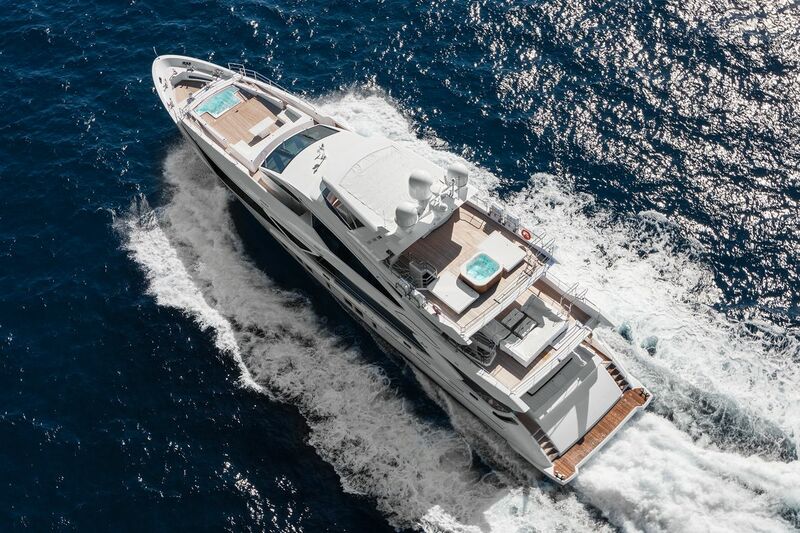 We do have available further amenity, owner and price information for the 42.67m (140') yacht CHEERS 46, so please enquire for more information.